This article is about scuttling ships. For the 19th-century British youth gangs, see scuttlers. Monument to the scuttled ships by Amandus Adamson at Sevastopol. The Russian Black Sea Fleet was scuttled prior to the Siege of Sevastopol during the Crimean War. Scuttling is the deliberate sinking of a ship by allowing water to flow into the hull. This can be achieved in several ways—seacocks or hatches can be opened to the sea, or holes may be ripped into the hull with brute force or with explosives. Scuttling may be performed to dispose of an abandoned, old, or captured vessel; to prevent the vessel from becoming a navigation hazard; as an act of self-destruction to prevent the ship from being captured by an enemy force (or, in the case of a vessel engaged in illegal activities, by the authorities); as a blockship to restrict navigation through a channel or within a harbor; to provide an artificial reef for divers and marine life; or to alter the flow of rivers. The Skuldelev ships, five Viking ships, were sunk to prevent attacks from the sea on the Danish city of Roskilde. The scuttling blocked a major waterway, redirecting ships to a smaller one that required considerable local knowledge. In 2012, a cog preserved from the keel up to the decks in the silt was discovered alongside two smaller vessels in the river IJssel in the city of Kampen, in the Netherlands. The ship, dating from the early 15th century, was suspected to have been deliberately sunk into the river to influence its current. The Spaniard conquistador Hernán Cortés, who led the first expedition that resulted in the fall of the Aztec empire, ordered his men to strip and scuttle his fleet to prevent the secretly planned return to Cuba by those loyal to Cuban Governor Diego Velázquez de Cuéllar. Their success would have halted his inland march and conquest of the Aztec Empire. HMS Sapphire was a 32-gun, fifth-rate sailing frigate of the Royal Navy in Newfoundland Colony to protect the English migratory fishery. The vessel was trapped in Bay Bulls harbour by four French naval vessels led by Jacques-François de Brouillan. To avoid its capture, the English scuttled the vessel on 11 September 1696. The British sank one ship on October 10, 1781 to prevent it from being captured by the French fleet. Furthermore, the York River, while protected by the French Navy, also contained a few scuttled ships, which were meant to serve as a blockade should any British ships enter the river. During the War of 1812, Commodore Joshua Barney, of the U.S. Navy, Chesapeake Bay Flotilla, sank all nineteen of his fighting vessels, to keep them from falling into the hands of the British, as he and his men marched, inland, in the defense of Washington DC. During the Belgian war of independence, Dutch gunboat commander Jan van Speijk came under attack from a mob of Antwerp labourers. When they forced him and his crew to surrender, he ignited a barrel of gunpowder, thus sinking his ship and killing himself and most of the crew. Van Speijk went on to become a national hero in The Netherlands. During the Crimean War, in anticipation of the Siege of Sevastopol, the Russians scuttled ships of the Black Sea Fleet to protect the harbour, to use their naval cannon as additional artillery, and to free up the ships' crews as marines. Those ships that were deliberately sunk included Grand Duke Constantine, City of Paris (both with 120 guns), Brave, Empress Maria, Chesme, Yagondeid (84 guns), Kavarna (60 guns), Konlephy (54 guns), steam frigate Vladimir, steamboats Thunderer, Bessarabia, Danube, Odessa, Elbrose and Krein. After the war, it became a technological challenge to recover the ships. In April 1861, the United States Navy steam frigate USS Merrimack was among several ships Union forces set afire or scuttled at the Gosport Navy Yard (now Norfolk Naval Shipyard) in Portsmouth, Virginia, to keep them from falling into Confederate hands at the outbreak of the American Civil War. The unsuccessful attempt at scuttling Merrimack enabled the Confederate States Navy to raise and rebuild her as the broadside ironclad CSS Virginia. Shortly after her famous engagement with the U.S Navy monitor USS Monitor in the Battle of Hampton Roads in March 1862, the Confederates scuttled Virginia to keep her from being captured by Union forces. In December 1861 and January 1862, Union forces scuttled a number of former whalers and other merchant ships in an attempt to block access to Confederate ports during the American Civil War. Loaded with stone before being scuttled, the scuttled ships were known as the "Stone Fleet." Those scuttled in December 1861 sometimes are called the "First Stone Fleet," while those sunk in January 1862 sometimes are termed the "Second Stone Fleet." During the War of the Pacific, as Chilean troops entered Lima and El Callao, the Peruvian naval officer Germán Astete ordered the whole Peruvian fleet to be scuttled to prevent capture by Chile. During the Spanish–American War, a volunteer crew of United States Navy personnel attempted to scuttle the collier USS Merrimac in the entrance to the harbor at Santiago de Cuba in Cuba on the night of 2-3 June 1898 in an attempt to trap the Spanish Navy squadron of Vice Admiral Manuel de la Cámara y Libermoore in port there. The attempt failed when she came under fire by Spanish ships and fortifications and sank without blocking the entrance. In 1904, during the Russo-Japanese War, the Imperial Japanese Navy made three attempts to block the entrance to the Imperial Russian Navy base at Port Arthur, Manchuria, China, by scuttling transports. Although the Japanese scuttled five transports on 23 February, four on 27 March, and eight on 3 May, none of the attacks succeeded in blocking the entrance. The Russians also scuttled four steamers at the entrance in March 1904 in an attempt to defend the harbor from Japanese intrusion. During the Siege of Port Arthur the Russians scuttled the surviving ships of their Pacific Squadron that were trapped in port at Port Arthur in late 1904 and early January 1905 to prevent their capture intact by the Japanese. In August 1914, SS Kaiser Wilhelm der Grosse was requisitioned by the Kaiserliche Marine and converted into an auxiliary cruiser, assigned to commerce raiding in the Atlantic. She was fitted with six 10.5 cm (4 inch) guns and two 37 mm guns. After sparing two passenger ships because they were carrying many women and children, she sank two freighters before she herself was sunk on 26 August 1914. She was caught refuelling off the shore of the then Spanish colony of Río de Oro in western Africa by the old British 6-inch gunned cruiser HMS Highflyer. Badly outgunned, the ship eventually ran out of ammunition. The crew abandoned and scuttled her. British sources at the time insisted that Kaiser Wilhelm der Grosse sank because of the damage inflicted by Highflyer. In December 1914, SMS Dresden was the only German warship to escape destruction in the Battle of the Falkland Islands. She eluded her British pursuers for several more months, until she put into Más a Tierra in March 1915. Her engines were worn out and she had almost no coal left for her boilers. There, she was trapped by British cruisers, which violated Chilean neutrality and opened fire on the ship. Dresden's Executive Officer - the future Admiral Wilhelm Canaris - negotiated with the British and bought time for his shipmates to scuttle Dresden. The Zeebrugge Raid involved three outdated British cruisers chosen to serve as blockships in the German-held Belgian port of Bruges-Zeebrugge from which German U-boat operations threatened British shipping. Thetis, Intrepid and Iphigenia were filled with concrete then sent to block a critical canal. Heavy defensive fire caused the Thetis to scuttle prematurely; the other two cruisers sank themselves successfully in the narrowest part of the canal. Within three days, however, the Germans had broken through the western bank of the canal to create a shallow detour for their submarines to move past the blockships at high tide. In 1919, over 50 warships of the German High Seas Fleet were scuttled by their crews at Scapa Flow following the deliverance of the fleet as part of the terms of the German surrender. Rear Admiral Ludwig von Reuter ordered the sinkings, denying the majority of the ships to the British. Von Reuter was made a prisoner-of-war in Britain but his defiant final act of war was celebrated in Germany. Though most of the fleet was subsequently salvaged by engineer Ernest Cox, a number of warships (including three battleships) remain, making the area very popular amongst undersea diving enthusiasts. Under the terms of the Washington Naval Treaty of 1922, the great naval powers were required to limit the size of their battlefleets, resulting in the disposal of some older or incomplete capital ships. During 1924 and 1925, the treaty resulted in the scuttling of the Royal Australian Navy battlecruiser HMAS Australia and the incomplete Imperial Japanese Navy battleship Tosa, while four old Japanese battleships, the Royal Navy battleship HMS Monarch, and the incomplete United States Navy battleship USS Washington (BB-47) all were disposed of as targets. Following the Battle of the River Plate the damaged German pocket battleship Admiral Graf Spee sought refuge in the port of Montevideo. On 17 December 1939, with the British and Commonwealth cruisers HMS Ajax, HMS Cumberland, and HMNZS Achilles waiting in international waters outside the mouth of the Río de la Plata, Captain Hans Langsdorff sailed Graf Spee just outside the harbour and scuttled the vessel to avoid risking the lives of his crew in what he expected would be a losing battle. Langsdorff shot himself three days later. When British and Commonwealth land forces attacked Tobruk on 21 January 1941, the Italian cruiser San Giorgio turned its guns against the attacking troops, repelling an attack by tanks. As British forces were entering Tobruk, San Giorgio was scuttled at 4:15 AM on 22 January. San Giorgio was awarded the Gold Medal of Military Valor for her actions in the defence of Tobruk. The ship was salvaged in 1952, but while being towed to Italy, her tow rope failed and she sank in heavy seas. As the British advanced toward Eritrea during their East African Campaign in World War II, Mario Bonetti—the Italian commander of the Red Sea Flotilla based at Massawa—realized that the enemy would overrun his harbor. In the first week of April 1941, he began to destroy the harbor's facilities and ruin its usefulness to the British. Bonetti ordered the sinking of two large floating dry docks and supervised the calculated scuttling of eighteen large commercial ships in the mouths of the north Naval Harbor, the central Commercial Harbor and the main South Harbor. This blocked navigation in and out. He also had a large floating crane scuttled. These actions rendered the harbor useless by 8 April 1941, when Bonetti surrendered it to the British. Scuttled ships included the German steamers Liebenfels, Frauenfels, Lichtenfels, Crefeld, Gera and Oliva. Also scuttled were the Italian steamers Adua, Brenta, Arabia, Romolo Gessi, Vesuvio, XXIII Marzo, Antonia C., Riva Ligure, Clelia Campenella, Prometeo and the Italian tanker Giove. The largest scuttled vessel was the 11,760-ton Colombo, an Italian steamer. The most dangerous problems for salvage were Brenta, which contained a booby trap sunk in one hold made of an armed naval mine sitting on three torpedo warheads, and Regia Marina minelayer Ostia, which had been sunk by the RAF with several of its mines still racked. Thirteen additional coastal steamers and small naval vessels were scuttled as well. Though a civilian contractor was retained to clear a navigable passage through the wrecks, it wasn't until a year later that headway was made in the effort to return Massawa to military duties. U.S. Navy Commander Edward Ellsberg arrived in April 1942 with a salvage crew and a small collection of specialized tools and began methodically correcting the damage. His salvage efforts yielded significant results in just 5½ weeks. On 8 May 1942, SS Koritza, an armed Greek steamer, had drydocked for cleaning and minor hull repairs. Massawa's first major surface fleet 'customer' was HMS Dido, which needed repairs to a heavily damaged stern in mid-August, 1942. Many of the harbor's sunken ships were patched by divers, refloated, repaired and taken into service. Ostia and Brenta were successfully salvaged, despite their armed mines. In 1941, the battleship Bismarck, heavily damaged by the Royal Navy, leaking fuel, listing, rendered mostly unmaneuverable—and with no effective weapons but still afloat, was reported to have been scuttled by her crew to avoid capture. This was supported by survivors' reports in Pursuit: the Sinking of the Bismarck, by Ludovic Kennedy, 1974 and by a later examination of the wreck itself by Dr. Robert Ballard in 1989. A later, more advanced examination found torpedoes had penetrated the second deck, normally always above water and only possible on an already sinking ship, thus further supporting that scuttling had made the final torpedoing redundant. After the Battles of the Coral Sea and Midway, the heavily damaged American aircraft carrier Lexington and the Japanese carriers Hiryū, Sōryū, Akagi, and Kaga were all scuttled to prevent their preservation and use by their respective enemies. In November 1942, in an operation codenamed Case Anton, Nazi German forces occupied the so-called "Free Zone" in response to the Allied landing in North Africa. On 27 November they reached Toulon, where the majority of the French Navy was anchored. To avoid capture by the Nazis (Operation Lila), the French admirals-in-command (Laborde and Marquis) decided to scuttle the 230,000 tonne fleet, most notably, the battleships Dunkerque and Strasbourg. Eighty percent of the fleet was utterly destroyed, all of the capital ships proving impossible to repair. Legally, the scuttling of the fleet was allowed under the terms of the 1940 Armistice with Germany. Anticipating a German seizure of all units of the Danish Navy as part of Operation Safari, mostly in Copenhagen but also at other harbours and at sea in Danish waters, the Danish Admiralty had instructed its captains to resist, short of outright fighting, any German attempts to assume control over their vessels, by scuttling if escape to Sweden was not possible and suitable preparations were made. Of the fifty-two vessels in the Danish Navy on 29 August, two were in Greenland, thirty-two were scuttled, four reached Sweden and fourteen were taken undamaged by the Germans. Nine Danish sailors lost their lives and ten were wounded. Subsequently, major parts of the Naval personnel were interned for a period. Old ships code-named "Corn cobs" were sunk to form a protective reef for the Mulberry harbours at Arromanches and Omaha Beach for the Normandy landings. The sheltered waters created by these scuttled ships were called "Gooseberries" and protected the harbours so transport ships could unload without being hampered by waves. Of the 156 German submarines ("U-boats") surrendered to the Allies at the end of World War II, 116 were scuttled by the Royal Navy in Operation Deadlight. Plans called for them to be scuttled in three areas in the North Atlantic Ocean west of Ireland, but 56 of the submarines sank before reaching the designated areas due to their poor material condition. Most of the submarines were sunk by gunfire rather than with explosive charges. The first sinking took place on 17 November 1945 and the last on 11 February 1946. To prevent a Soviet inspection team from examining surrendered Imperial Japanese Navy submarines after World War II, the United States Navy conducted Operation Road's End, in which it scuttled 24 of the submarines in the East China Sea off Fukue Island on 1 April 1946. Nine more Japanese submarines followed on 5 April, and another six went down by early May. In addition, U.S. Navy submarines sank four surrendered Japanese submarines as targets in the Pacific Ocean near Hawaii in May and June 1946, and the Royal Australian Navy sank six or seven (sources differ) surrendered Japanese submarines in the Seto Inland Sea on 8 May 1946 in Operation Bottom. The July 1946 atomic bomb tests at Bikini Atoll in Operation Crossroads left the United States Navy with a large number of damaged target ships contaminated with radioactivity. Twenty-seven of these ships – three battleships, two heavy cruisers, eleven destroyers, four submarines, and seven attack transports – were scuttled in the Pacific Ocean between February and November 1948, while the light aircraft carrier USS Independence (CVL-22) was scuttled on 29 January 1951. 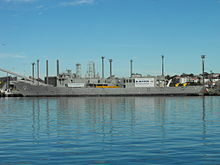 Today, ships (and other objects of similar size) are sometimes sunk to help form artificial reefs, as was done with the former USS Oriskany in 2006. It is also common for military organizations to use old ships as targets, in war games, or for various other experiments. As an example, the decommissioned aircraft carrier USS America was subjected to surface and underwater explosions in 2005 as part of classified research to help design the next generation of carriers (the Gerald R. Ford class), before being sunk with demolition charges. Ships are increasingly being scuttled as a method of disposal. The economic benefit of scuttling a ship includes removal of ongoing operational expense to keep the vessel seaworthy. Controversy surrounds the practice. Notable actions against the practice include the USS Oriskany, which was scuttled with 700 pounds of PCBs remaining on board as a component in cable insulation, contravening the Stockholm Convention on safe disposal of persistent organic pollutants, which has zero tolerance for PCB dumping in marine environments. The planned scuttling of the Australian frigate HMAS Adelaide at Avoca Beach, New South Wales in March 2010 was placed on hold after resident action groups aired concerns about possible impact on the area's tides and that the removal of dangerous substances from the ship was not thorough enough. Further cleanup work on the hulk was ordered, and despite further attempts to delay, Adelaide was scuttled on 13 April 2011. Scuttled ships have been used as conveyance for dangerous materials. In the late 1960s, the United States Army scuttled SS Corporal Eric G. Gibson and SS Mormactern with VX nerve gas rockets aboard as part of Operation CHASE — "CHASE" being Pentagon shorthand for "Cut Holes and Sink 'Em." Other ships have been "chased" containing mustard agents, bombs, land mines, and radioactive waste. Colombian drug cartels have used narco-submarines to smuggle cocaine from Colombia to the United States. Their fiberglass construction makes them nearly invisible to radar, sonar, and infrared. After unloading or when intercepted, the crew scuttles the submarine. With the main evidence of trafficking gone, the crew go from suspected traffickers to castaways who, in accordance with maritime law, must be rescued and cannot be charged. However, laws were recently changed to address what was seen as an exploitation of legal loopholes. The United States now considers the operation of an unflagged (unregistered) vessel, designed solely for the clandestine transport of contraband, a crime in and of itself that carries severe penalties. ^ "Viking dig reports - Roskilde". Ancient history in-depth. BBC. 2014. ^ "Excavation, recovery and conservation of a 15th century Cog from the river IJssel near Kampen". Ruimte voor de Rivier IJsseldelta. Rijkswaterstaat. September 2015. Retrieved 14 September 2017. ^ Ghose, Tia (17 February 2016). "Medieval Shipwreck Hauled from the Deep". Live Science. Retrieved 14 September 2017. ^ "Late Medieval Cog from Kampen". Medieval Histories. 21 February 2016. Retrieved 14 September 2017. ^ Anonymous, The Russo-Japanese War, Kinkodo Publishing Co., 1904, pp. 83-86. 91-93, 251-256. ^ Anonymous, "Harbor Blocked", The Evening Bulletin (Maysville, Kentucky), March 15, 1905, p. 1. ^ Paterson, Lawrence (2009). Black Flag. The Surrender of Germany's U-Boat Forces 1945. Pen & Sword books. pp. 161–163. ISBN 978-1-84832-037-6. ^ Paterson, Lawrence (2009). Black Flag. The Surrender of Germany's U-Boat Forces 1945. Pen & Sword books. p. 174. ISBN 978-1-84832-037-6. ^ Shallal, Suhair. "PCBs Released from the ex-Oriskany Following Deployment as an Artificial Reef: Approach for Assessment of Human Health and Environmental Risks". Retrieved 2010-03-15. ^ West, Andrew (30 March 2010). "Judge fires broadside at rush to sink warship". The Sydney Morning Herald. Retrieved 3 April 2010. ^ Harvey, Ellie; West, Andrew (16 September 2010). "Judge orders tough new rules for scuttling". The Sydney Morning Herald. Retrieved 20 September 2010. ^ Bull, John. "SPECIAL REPORT, PART 1: The Deadliness Below". The Daily Press. Retrieved 2007-06-18. George, S. C. (1981). Jutland to Junkyard. Edinburgh: Paul Harris Publishing. ISBN 9780862280291.